New From Sutherland Engineering - the Duo mono block phono stage! 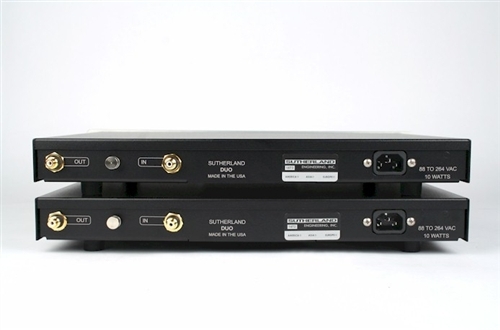 The DUO is derived from the cost no object Phono Blocks and the cost-optimized 20/20. No expense was spared in the design and construction of the Phono Blocks. 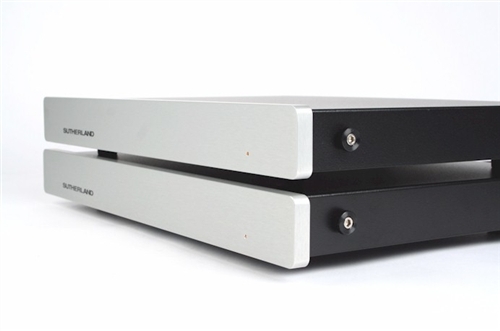 The Phono Blocks are at the pinnacle of phono preamp performance. It just doesn't get any better. The 20/20 was designed to get the most performance possible at its predetermined price point. To get there,extra was spent to get premium parts and circuitry into the signal path. Consequently, some expenses were squeezed out of less important areas. Those trade-offs have worked very well. The 20/20 has delivered an extremely high level of performance at a reasonable price. It is an incredible performance value. What if all the price constraints in the 20/20 were lifted ? The price goes up, the performance goes up. It starts looking a lot like the Phono Blocks. The actual signal path of the 20/20 is quite good. It uses a circuit very similar to the Phono Blocks. In critical positions, it also uses the same premium quality (and high cost) components. Very little was heldback in that area. The opportunity for upgrade is focused on a more refined power supply, improved circuit board properties and dual chassis construction. 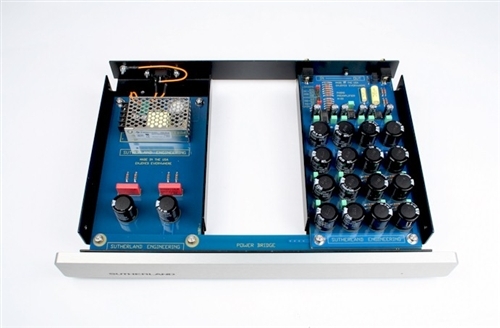 The 20/20 uses external, bench-top power supplies. They are cost effective, reliable and offer good performance. Each supplies output is extensively filtered and regulated into one +/- 15 volt source for both of the gain stages. The Phono Blocks have built in AC power supplies. There is an IEC power inlet on each chassis to accommodate the user's personal power cord choice. Two completely separate power sections (each providing isolated +/- 15 volts) are provided for each channel. One for each of the two gain stages.Each is independently filtered and regulated to provide the ultimate foundation for the gain stages. Each DUO has a built in AC power supply.There is an IEC power inlet on each chassis to accommodate the user's personal power cord choice. The shielded power supply module has one output. That output is split into two branches. One for each of the two gain stages. Each of those branches is independently filtered and regulated to provide a substantial foundation for the gain stages. The DUO mitigates circuit board dielectric properties using the same approach that has worked so well in the Phono Blocks. Circuit board thickness is doubled from the standard 1/16” thickness to 1/8” thickness. Not only is dielectric absorption addressed, but further advantages are realized with an extremity rigid platform for component mounting. It is the cost-no-object, preferred way to go. Anytime two conductors are at a different voltage potential, there is an electric field generated between them. The dielectric (the insulation between conductors) within that field become involved in charge storage. If not carefully considered, that extra charge storage can time smear details of a musical signal. Circuit board material is a dielectric.With normal double-sided construction, there are copper conductors on each side of the board. Unintentionally, a new capacitor is introduced into the circuit, formed by top surface copper, bottom surface copper and the circuit board dielectric sandwiched between the two. It is NOT the quality of capacitor we want to have in a high-end signal path. Some manufactures make the situation even worse by going to multi-layer boards in the analog audio sections. Instead of two layers of copper, there are four or more layers of copper. Even worse than that, the dielectric between layers is much thinner and the undesired capacitive effect is inversely proportional to thickness. At best, some manufactures make small, incremental improvements by using exotic board material. The Duos addresses the issue of circuit board dielectric by doubling the thickness of an FR4 fiberglass circuit board. Just that one choice reduces electric field strength by one-half. Additionally, the area of copper interacting with board dielectric is also reduced in critical regions. Signal lines are kept narrow. Power lines are extremely wide. Such choices get us refined performance. Good solid advantages based up the application of good solid physics. A sense of space and dimensionality is conveyed by the difference in the left and right channel information. To preserve those auditory clues, each channel must be isolated from the other and not spill over. 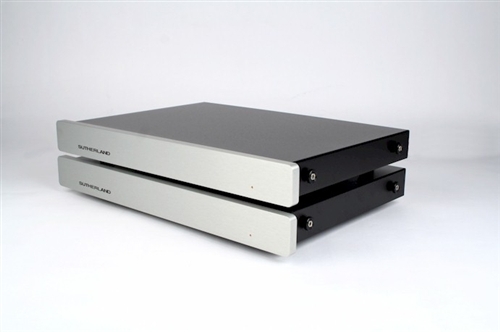 Both the DUO and the Phono Blocks use a stack of two mono phono preamps for stereo. Absolutely nothing is shared between the left and right channels.Each channel is a completely free standing mono phono preamp. That is the ultimate in channel separation. The ultimate in spatial listening involvement! FR-4 fiberglass circuit boards, Double-sided with plated thru holes. 1/8” thick for extra rigidity and minimal dielectric influence. Release the top cover by removing the four knurled screws. Audio boards are located on the right side of the enclosure. On the left side of each circuit board you will find headers for receiving the plug-in configuration shunts. Legends printed on the circuit board clearly indicate position and function.